Mr. Savvy and I definitely prefer beef when planning out our meals when it comes to protein. Well, there is bacon too, but sometimes you just want something a bit more substantial that you can sink your teeth into…like beef. Though most cuts of beef have gone up in price over recent years, beef is still a regular guest on our dinner table thanks to stocking up during sales. As you all know, I love trying out and creating different recipes. So, I enjoy visiting BeefItsWhatsForDinner.com now and then for new ideas for quick and easy beef recipes. Just the other day I was asking Mr. Savvy what beef dinner he wanted next after being inspired by hearing about the Beef Checkoff and he mentioned steak fingers. The Beef Checkoff is actually pretty cool as it’s a national marketing and research program that’s been around as long as I have (since 1985), and is directed by cattle farmers, ranchers and importers. Now, I will admit chicken fried steak with gravy is one of my favorite guilty pleasure meals. So, he didn’t really have to twist my arm very much. Country fried steak can seem like a complicated dish, but it’s actually quite quick and easy once you get a few steps of prep work done. And golly, is it worth it. Yes, I may have let my inner southern accent really shine through on that last sentence. But, in all seriousness, what’s not to love about tender juicy beef wrapped up in a crispy shell and dipped in a creamy gravy with a slight black pepper kick? Plus, beef has 10 essential nutrients and honestly no other meat keeps me feeling as full and energized as beef does. 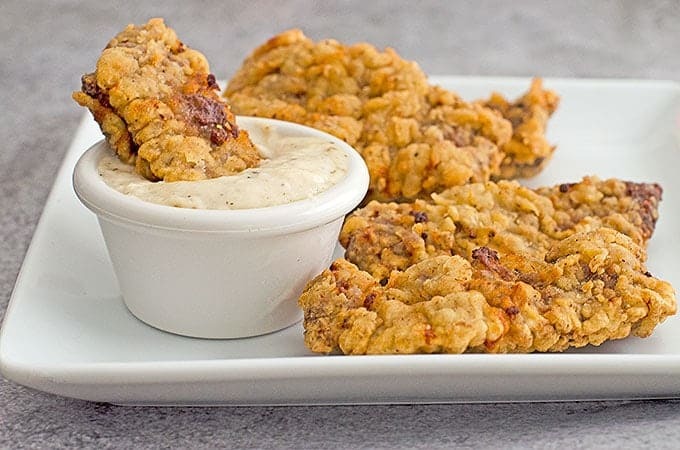 This Chicken Fried Steak Fingers Recipe with Cream Gravy is also loved by all ages and can be eaten for any meal and even as an appetizer. You can even make up a big batch at once and freeze as they reheat very well in the oven. Mr. Savvy loved these chicken fried steak fingers with cream gravy so much that he’s already pulled another pack of cubed steak out of the freezer hoping I’ll make more! 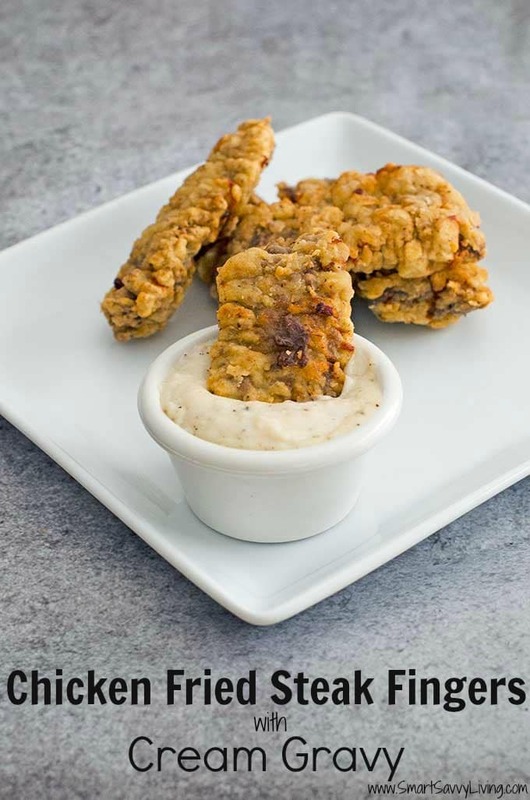 This Chicken Fried Steak Fingers recipe with Cream Gravy is great to serve for any meal and even as an appetizer. Cut cubed steak into 1-inch strips. If you freeze the meat for about 15 minutes before hand, it will be easier to slice. Season steak fingers with a sprinkle of salt and pepper and set aside. On a large plate, stir together flour, cayenne pepper, garlic powder and about 1/2 teaspoon black pepper and 1 teaspoon seasoned salt. In a wide shallow bowl, whisk together eggs with the buttermilk and an additional pinch of salt and pepper. First dredge the steak fingers in the flour, then dip in the egg mixture, and then dredge in the flour again. Set aside on a wire rack as you bread the remaining steak fingers. Set aside the remaining breading flour. In the mean time, heat oil to approximately 2 inches high in a deep cast iron skillet or other large skillet or dutch oven to about 350F. When the oil is almost heated, I like to give the steak fingers one last light dredge in the flour so they have a nice crisp coating and then fry about 5 - 6 at a time (you don't want to overcrowd the pan) until they are golden brown on each side. You'll want to flip them once brown on one side. Place fried steak fingers on an absorbent paper-lined oven-safe dish. You can keep them in the oven at about 200F or the warm setting while you fry the rest of the fingers. I prefer this to covering with foil as they can get soggy. Once all the steak fingers have been fried, either pour out the grease from the pan into a bowl, or grab another large skillet and add 4 Tablespoons (1/4 cup) of the oil you fried the steak fingers in. You can also use butter or bacon fat. If you get any crumbs of the fried flour in the oil, don't worry as that just adds more flavor. Add 4 Tablespoons of the seasoned flour mixture from breading (or fresh flour) to the oil and whisk together over medium-low heat until a paste forms, adding more flour if needed. Continue cooking the paste until it's a darker golden brown, about 2 minutes or so, to cook out the flour taste. While whisking constantly, pour in the milk. Continue whisking thoroughly to get any lumps out. Let simmer until gravy thickens and then whisk in the cream. If the gravy is still too thick for your liking, add in a touch more milk or cream until your desired consistency. Season gravy to taste with salt and pepper. I like to also add in a pinch of cayenne and garlic powder. Serve warm steak fingers alongside gravy for dipping. I like to round out the meal with mashed potatoes, a green veggie and Texas toast or biscuits. Oh these look so good! 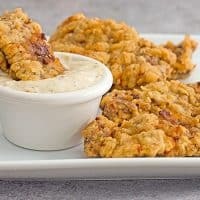 My family loves the chicken fried steak, and these would be so fun being the fingers with the gravy to dip in! Cant wait to try these! I am wanting to try your recipe using sprouted flour and either almond or coconut milk for a special diet my sisters and I are on. My question is about the freezing and re-heating of these CFS fingers. After frying and cooling them I need to pop them into the freezer for 5 days. What do you advise for bake time and temperature to re-heat them? And will they maintain the “Crunch” after reheating? Thanks so much for stopping by. To reheat in the oven I’d use a temperature of 400 – 425°F, depending on how hot your oven runs, and bake for probably 15 – 20 minutes from frozen. To help them stay crisp, I’d bake them directly on the pan and flip halfway through. You could also partially cook them and finish cooking/warm them up by frying again to get that true fried crunchy texture, if that is an option when you’re ready to serve. Good luck!